Although most people think of Bambi as a cute forest creature with retiring behavior, due to an growing population, deer have become a major garden pest throughout the country. Although they tend to keep to forest edges and fields grazing on grasses and leaves, they become more daring when food is scarce, venturing into suburban yards. Deer graze and browse leaves, stems, and buds of many woody plants, as well as alfalfa, roses, corn, vegetables, and fruits. Their damage is evident because they leave jagged leaf edges on the eaten plants, not to mention distinctive cloven hoof prints and bean-shaped droppings. Although deer will eat anything if hungry enough, given a choice they tend to stay away from succulent plants, poisonous plants, pungent flavored plants, and plants with hairy or furry leaves. 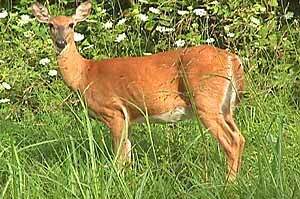 Plant ornamentals with these qualities in areas of heavy deer traffic. Some gardeners have had success using human hair, dog hair, soap, blood meal, rotten eggs, hot pepper, or predator urine spread around or on flowers and trees. Deer can be scared away by motion sensor devices attached to lights or loud music. Of all the methods, though, fencing is the most reliable. It's best to erect the fence before Bambi has found your garden or yard.